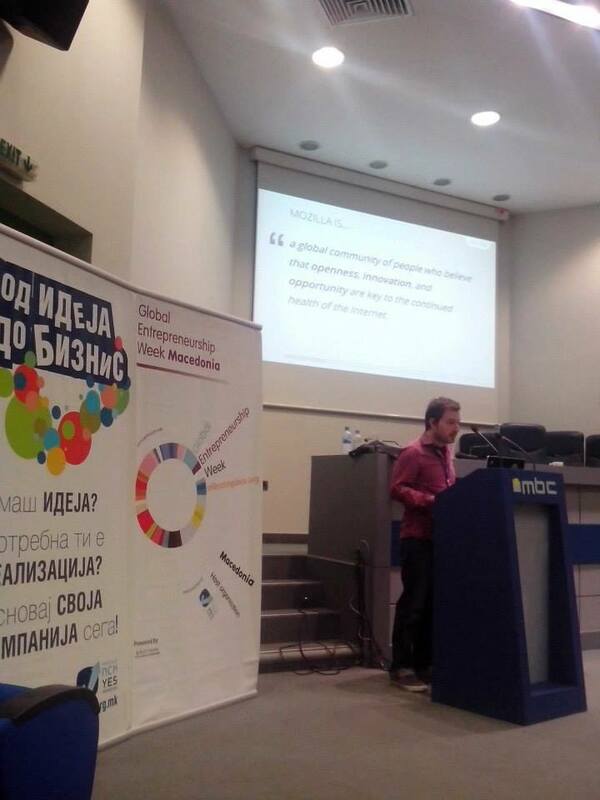 On the 26th October 2013, Damjan Georgievski and I (Goce Mitevski) participated in Mobile AppCamp Macedonia 2013 — one of the biggest Mobile Technology event in the Balkans — and I gave an introductory presentation about Firefox OS. Goce Mitevski presenting Firefox OS on Mobile AppCamp Macedonia 2013 in Skopje, Macedonia. My name is Goce Mitevski. I’m a part of the Mozilla community and a Mozilla Representative for Macedonia. Today, I’m here to give you a brief introduction on a very exciting project, Mozilla is working on – a really fresh take on free and open-source mobile operating systems. This presentation will not be very technical, though I will include links to pages with technical information in the slides. I will give you a quick overview of Firefox OS and we’ll see a video of Firefox OS in action. Also, I have a Firefox OS device with me today – the Geeksphone Keon – so hopefully, anyone who’s interested will have a chance to test it, after the presentation. By the way, the slides from this presentation are already available on Github. Before I start talking about Firefox OS, I would like to first introduce Mozilla, the Firefox browser and the Open Web. So, how did it all started? In the 1990s, Netscape and Microsoft made one of the first browsers for the World Wide Web. Netscape made Navigator and Microsoft made Internet Explorer and the so called “Browser Wars” had started. The most important difference between Navigator and Internet Explorer was that Navigator was not free to the general public. Internet Explorer was free and bundled in the Windows operating system and that lead to Netscape losing to Microsoft. As a winner, Microsoft started developing and including proprietary components into the World Wide Web. Internet Explorer started to get broadly adopted. It was not an easy time for Netscape and brave decisions had to be made. So, in 1998 Netscape decided to open-source Navigator and start the Mozilla project. The source code of Netscape Navigator 4.0 was released to the public in hopes that it will lead to a popular open-source project. But then, an initiative, to build a new browser from scratch emerged and after a few years Firefox was born. At that time, Firefox was a breakthrough and quickly became a tough competitor of Internet Explorer. Mozilla became relevant and the Open Web was introduced. So, then, what is Mozilla? It is a free software community. It is supported by the Mozilla Foundation and the Mozilla Corporation. It works on building a better Internet, by promoting openness, innovation & opportunity on the Web. And it’s doing that for the past 15 years! So, through many different projects, Mozilla literary transformed the Web from a network based on proprietary technologies to a network based on standards and open technologies. But still, there is a lot more work to be done. And that’s why we’re taking on a lot of new challenges. The mobile Web, for example, needs to be more open and that’s where the Firefox OS project comes in. Firefox OS, also known as Boot to Gecko or B2G, is a Linux-based open-source operating system for mobile devices. When the project was introduced in 2011, many people were skeptical about it and couldn’t see the need for “yet another mobile operating system”. Well, Firefox OS is not “yet another mobile operating system” and it is different from Android, iOS or Windows Phone in many aspects. First of all, Firefox OS is the only truly open-source mobile operating system out there. It is developed in the open and its source is always available to the public. So, unlike Android, which is open-sourced under the strict control of Google and basically developed by Google, Firefox OS is developed by a community and is open to contributions from anyone. And that’s possible because Firefox OS, like all Mozilla products, does not include proprietary technologies that need to be protected and uses the existing technologies of the Web. Basically every segment of the user interface in Firefox OS is a Web app. Any modifications you make to the user interface and any applications you create to run on Firefox OS are Web pages, of course with enhanced access to the mobile device’s hardware and services. Well, the operating system itself, consists of three layers, all of which are dedicated to different segments of its architecture. The layers are: Gaia, Gecko and Gonk. Gecko is the application runtime, basically a layer that provides all of the support for the HTML5 open standards. It makes sure those APIs work well on every operating system Gecko supports. Gonk is the lower level operating system of the Firefox OS platform, consisting of a Linux kernel and a layer that enables direct access to the hardware components. You could say that Gonk is a very simple Linux distribution. And that’s basically it. That’s the simplified overview of the Firefox OS architecture. For more technical details, please visit the Mozilla Developer Network or just have a look at the links on the last slide. Like any mobile operating system, Firefox OS too has a marketplace, for quick and easy distribution of apps. The main thing to note here is that Mozilla isn’t forcing developers on having their apps hosted exclusively on the Firefox Marketplace or insisting on having a single marketplace for Firefox OS apps. Since Firefox OS apps are Open Web Apps – basically Web pages – you can get them from any channel. OK, so now, let’s have a look at a demo of Firefox OS, presented by Jay Sullivan of Mozilla. The devices you saw on this video presentation were mainly low-end devices and that’s on purpose, because Mozilla together with its partners, through the Firefox OS project, is trying to develop affordable smartphones based on open technologies, mainly for markets that cannot afford expensive mobile devices or mobile operating systems. Some of the devices mentioned in the video are already available in Spain, Colombia, Venezuela, Poland and recently, Brazil. In the near future Firefox OS devices will become available in Germany, Greece, Hungary, Serbia and Montenegro. So, why is Mozilla doing all this? Well, that brings us back to the beginning of this presentation. Mozilla is doing this to keep the Internet open, available to all and move it forward through innovation and opportunities. When powerful corporations create mobile marketplaces and lock the developers to their platforms, they’re not promoting innovation or opportunities. They’re actually limiting opportunities and forcing developers to create apps that will feed the corporate business and not innovations. Developing for proprietary platforms, requires you to learn proprietary APIs. Selling apps through proprietary mobile marketplaces, requires you to accept many limiting terms of service. On the proprietary marketplaces you’re free to sell only what you’re allowed and not what you choose to. Mozilla will continue to work on moving the Web forward, but we could always use a helping hand. As I mentioned several times during this presentation, we’re open.